When I started blogging I was thrilled to find out that there were other bloggers in and around Ohio. I have made some great relationships and had the opportunity to build personal connections by getting to know some of the wonderful ladies that that blog in and around the Buckeye State. 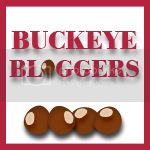 Here is the updated Buckeye Bloggers linky! Only family friendly blogs please! Leave a direct link to your blog, not a post or giveaway. Please feel free to follow other blogs that interest you. I know that not every blog is going to be up your ally. No worries. However I am sure that you can find someone who interests you enough to share some love. Feel free to write a post, tweet or share!